Massachusetts-based French Country Waterways is a family-owned and -operated company whose ships have been plying the canals of France for decades. 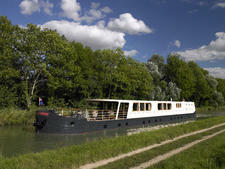 The company owns and operates its own fleet of five hotel barges with passenger capacities that range from eight to 18. The company has carved a niche for its more luxurious interpretation of the barge experience, one that focuses both onboard and on-land. Barges are outfitted to resemble floating country house hotels (albeit small ones!) and onshore activities ranging from dinner at Michelin-starred restaurants to hot air balloon rides are standard activities. 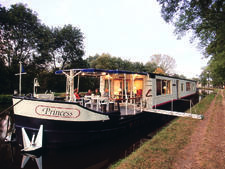 As befits its name, French Country Waterways offers only France-based canal trips. Its ships ply the waters of Burgundy, the Upper Loire Valley, Champagne and Alsace-Lorraine in six-night voyages (departing Sunday, returning Saturday). Cruises are offered between March and October. French Country Waterways' president Glenn Carr says "we force people to step back from their modern lives" and, indeed, you will find no telephones, televisions, radios or Internet capabilities (horrors!) on these barges, though they are all fully air-conditioned. What you will find? Comfortable, even spacious staterooms, configured both in twin and double categories; cozy, English country-house-esque book-lined lounges and top-deck observation areas. All are equipped with private bath. Mealtime -- as one would expect on a canal cruise of France -- is a highlight of the day and onboard chefs use ingredients picked up in the village-of-the-moment. French wines are included in the fare. Otherwise, sightseeing is the primary diversion; each barge organizes daily activities though independent-minded folk can borrow a bicycle and head off on their own. The biggest difference between a canal cruise and a river voyage is the pace; these barges move at about four or five miles per hour (as opposed to 10 - 15). 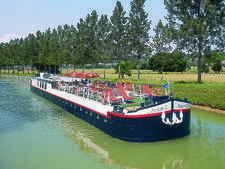 French Country Waterways markets primarily to U.S. and Canada travelers in the 50-plus age range and aims for travelers who are more interested in an offbeat and in-depth experience of a particular region of France -- as opposed to folks who simply like to cruise. Passengers are typically very well traveled and are not necessarily fans of the mega-cruise ship experience. This is not an experience good for families with small children (unless the family charters an entire barge). 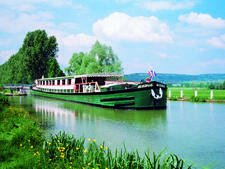 The Horizon II, which underwent a renovation that transformed the ship from 12 passengers to eight, sails three unique itineraries in Burgundy, including the western part of Burgundy (previously sailed by French Country Waterways' Liberte), which features a tour of the hilltop town of Vezelay and the medieval river port of Auxerre. Horizon II's northern Burgundy itinerary visits Chablis, the 12th century Abbaye de Fontenay and the 16th century chateau of Ancy-le-Franc. The 12-passenger Nenuphar focuses on France's Champagne region. It received extensive renovations in 2006. And the eight-passenger Princess centers on Champagne and Alsace-Lorraine; among the standouts on this voyage are a visit to the city of Reims, a tour of Strasbourg and Champagne tasting at Moet & Chandon. 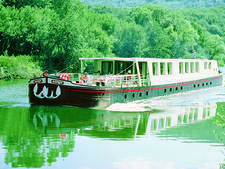 In 2005, French Country Waterways launched its newest, most elegant vessel. The 12-passenger Adrienne is sailing Loire Valley canals once plied by Nenuphar, highlighted by visits to France's historical Chateau region and a cruise across the unique Briare Canal bridge, an aqueduct designed by Gustave Eiffel (of the tower fame) carrying vessels over the Loire River, a span of more than 600 meters (.4 mile). As noted above, French Country Waterways sails only in provincial France, where regions include Burgundy, Champagne and the Loire Valley.